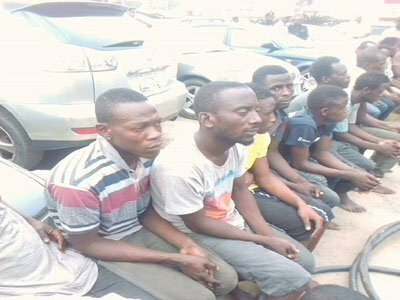 The police have arrested six persons who allegedly vandalised the Nigerian National Petroleum Corporation (NNPC) pipelines at Abule Egba, Lagos. It was learnt that their action resulted in the fire which destroyed buildings and vehicles worth millions of naira last year. 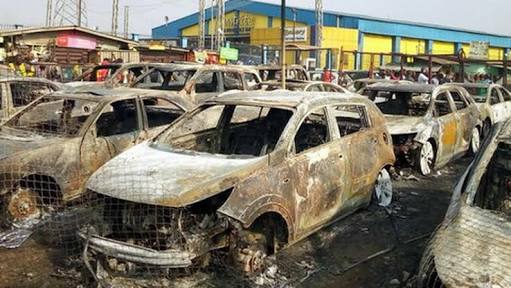 Parading the suspects yesterday, Police Commissioner Imohimi Edgal said: “On December 18, 2018, at about 2am, there was a fire outbreak at Isopako Awori in Abule Egba area of Lagos State. “The fire emanated from the NNPC pipeline that was deliberately ruptured by the vandals in their bid to siphon premium motor spirit (PMS) from the pipe. “It destroyed 100 houses and 77 vehicles worth millions of naira. “Oyakunle confessed that the workshop was located on the spot to enable them siphon fuel undetected,” he said. Edgal said Ewenla had been declared wanted over the incident. The gang, he said, had been in the illicit business for years.